Last Thursday, on 6 June, PMI Kazakhstan Chapter officially launched its subdivision in Atyrau and is proud to announce that from now on its targeted operations cover three cities of Kazakhstan demonstrating the highest demand for project management profession support across the country! The informational presentation gathered 23 professionals from various industries and companies, and we would like to thank everyone who attended the event for their interest, enthusiasm and active participation. The events planned until the end of this year in Atyrau include several master classes on the most actual topics in project management profession and monthly networking meetings in the format of "coffee talks". Stay tuned with PMI Kazakhstan Chapter announcements for getting more value from your membership! 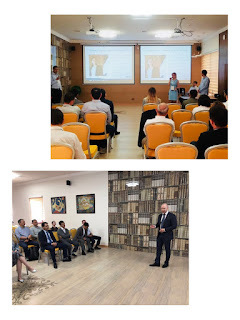 PMI Kazakhstan Chapter would like to thank Infinity Plaza Atyrau and PMI volunteers Sergei, Marlen, Doszhan, and Yerlan for their great support in the Atyrau launch event organization. PMI Kazakhstan Chapter, being a non-commercial organization dedicated to project management profession development in the country, also remains open for monetary and non-monetary sponsorship offers from interested organizations. Please contact us at pmikazakhstanchapter@gmail.com for more details!